Teaching transpiration can be tricky. This is because to understand transpiration you have to understand many different concepts that can seem unrelated. 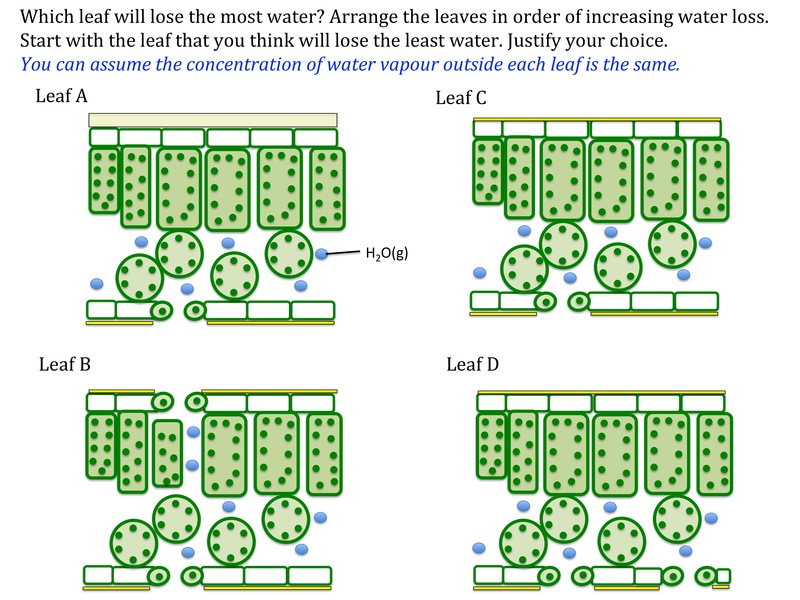 Osmosis, photosynthesis, leaf structure, particle model and evaporation, diffusion and concentration gradients all must be understood and related together to construct a ‘water tight’ understanding. Students also have to understand a counterintuitive concept, that is, in order for all plant cells to get water, the plant must lose water. A useful starting point is to get students to identify the factors that affect the drying of clothes on a washing line and go from there. Ask students to predict what will happen when capillary tubes of different diameters are placed into water. How does this relate to water transport in plants. You can make a fantastic leaf imprint using nail varnish to investigate stomata distribution. It’s worth pointing out that stomata are actually present on all parts of a plant – not just leaves. Challenge students to find some and click here for a method on measuring stomata density from SAPs.